adapt existing space technology for its own needs…. As the West evolves it will produce more and more expensive science fiction movies which attempt to show us how civilization will end if we do not mend our high carbon-footprint ways. OTOH, poor but technically proficient nations like India should be able to show us how low cost technology can improve human lives, even that of westerners. 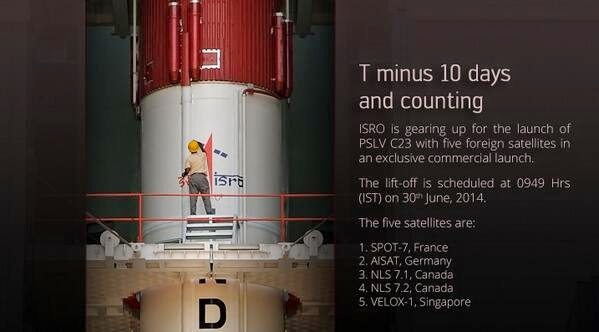 The Polar Satellite Launch Vehicle (PSLV-C23) today helped launch French, German, Canadian and Singaporean satellites. Modi has also spoken about a South Asian (SAARC) satellite. This will be an excellent confidence building measure. At the end of the day our goal should be to leave behind a world that treats the next generation more humanely than previous ones. Technology can solve many of the problems but in our opinion we have to find new ways of conflict management at the personal, society, national and global level. The human touch is often free of cost but the most valuable. While developing technology let us not ignore the human touch. money invested in making the Hollywood movie,” Modi added. the envy of space programmes world-wide. Modi said the country must be proud of its space programme, developed in the face of “great international pressure and hurdles”. to develop its own missile technology.